Victor Moses in a mid-air contest with a Tottenham defender during FA cup semi final at Wembly stadium on Saturday. 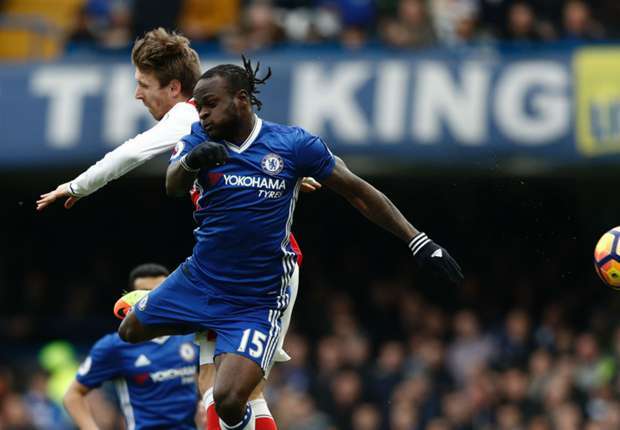 Nigerian international Victor Moses has tagged Chelsea fans as ''the best in the world'' for getting behind the team in their 4-2 triumph over Tottenham Hotspur. Willian’s brace plus goals from Eden Hazard and Nemanja Matic powered the Blues past Mauricio Pochettino’s men to reach the FA Cup final. Arsenal face Manchester City in the second semi-final on Sunday with the winner facing Antonio Conte in the final billed for May 27. The Stamford Bridge giants have won the title seven times from 11 appearances in the final – with their last success in 2012 under manager Roberto Di Matteo.